Please join us to help celebrate our 5th Annual Booster Golf Tournament! 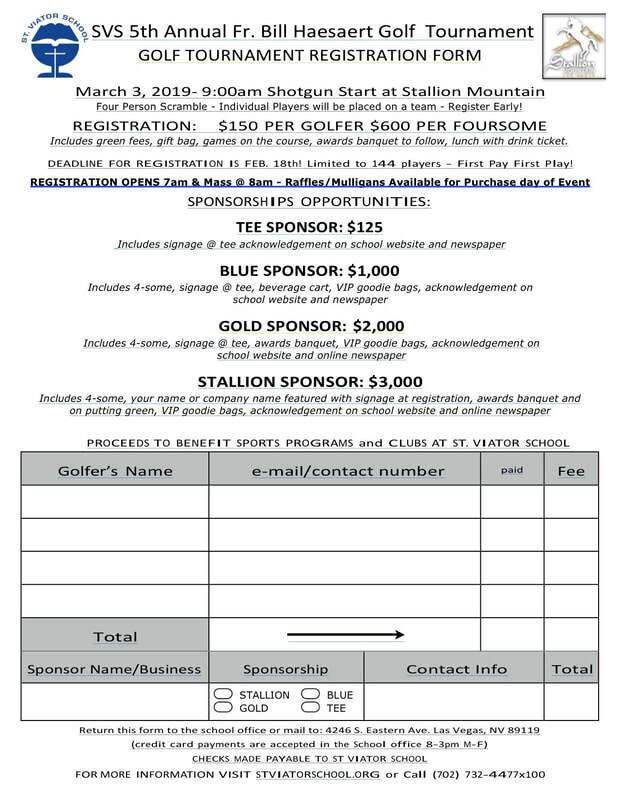 St. Viator School will host its 5th Annual Boosters Golf Tournament on March 3rd, 2019 at Stallion Mountain Golf Club . This course is within close proximity of the Saint Viator Catholic Community, it has a 7,351-yard layout that was designed by PGA Tour legend Jim Colbert and golf architect Jeff Brauer. ​This is a fundraising and alumni social event where all proceeds will be used to continue the work of our Booster Club supporting the Athletic Program and Clubs at our school. Support has included uniforms, registration fees, and equipment. The cost per golfer is $150 (or $600 per foursome), which includes a tasty lunch, a gift bag, a ton of fun and some great Las Vegas sunshine! We will also have some exciting golf skill-based contests and a raffle. Whether you are a golfer or not, we invite you to consider a sponsorship opportunity. We have three levels of event sponsorships available along with opportunities to purchase tee signs with your name or company logo to be placed on the course. We are also looking for donations of raffle items that will entice the golfers to purchase tickets in order to support our students. St. Viator School is an established 501(c)3 so all donations and a portion of sponsorships and play are tax deductible! Like many things in recent years, the cost to operate the athletics program and clubs at the school has increased particularly in the areas of insurance and equipment. In our 50 years, thousands of kids have participated in these programs. Team sports and clubs encourage and develop teamwork, respect, self-esteem, working toward a shared goal and friendship. These programs are an important complement to our academics and help our students to be well-rounded individuals. The form below contains details on sponsorship and registration. If you have donation items or any questions please contact Jennifer Jones at (702) 480-4304 or the school office with any questions. Your support in any manner will make a difference and is greatly appreciated!